Posh striker Lee Angol takes the ball round MK Dons 'keeper David Martin, but his second minute shot was hacked off the goal-line. Photo: Joe Dent/theposh.com. Peterborough United suffered a crushing, and possibly promotion-busting, League One defeat at home to MK Dons today (January 28). Four goals in 25 second-half minutes delivered a much-deserved victory for the Dons against a poor Posh side who have once more hit the buffers in January. Harvey Barnes (hidden) shoots MK Dons into the lead at Posh. Photo: Joe Dent/theposh.com. It’s now one win in seven League One matches, and while the gap to the top six remains manageable, on current form the play-offs look a distant dream. Manager Grant McCann asked his team to be brave in possession and to take risks, although he probably didn’t mean on the edge of their own penalty area as twice Posh were dispossessed in dangerous areas in the opening 10 minutes and required good defensive blocks to escape. McCann tweaked his formation and made four changes to his starting line-up. How he must have wished he could have instilled some confidence to players who have taken a few knocks lately. 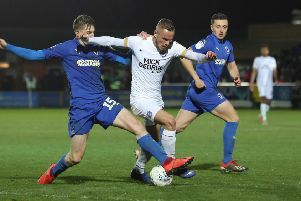 But Posh laboured thereafter until Marcus Maddison, playing wide on the right, started to trouble his marker George Williams. One right-footed cross was missed by Martin Samuelsen in front of goal and another was spilled by Martin, but straight to a defender. Central defender Ryan Tafazolli was the man most in possession for Posh which proves how patient (or negative depending on your point of view) the team’s passing was. MK always looked comfortable on the ball and possessed three lively, mobile strikers, but they took some poor options before the break when a goal looked possible. Nicky Maynard, Chuks Aneke and Kieran Agard were all denied by superb defensive blocks, the final one from left-back Jerome Binnom-Williams who was starting his first League One match since September 17 in place of the ill Andrew Hughes. Bostwick and co came to the rescue on more than one occasion after the break before the inevitable happened just past the hour mark. A short corner was worked into the penalty area and on-loan Leicester man Harvey Barnes was on hand to steer the ball home. McGee complained bitterly about something that wasn’t even obvious to the frustrated home crowd. But complaints were soon rendered irrelevant as Kieran Agard fired home from inside the area on 72 minutes and Chuks Aneke smashed home from outside the box in spectacular fashion two minutes later. And Aneke made two Posh defenders look silly before completing the scoring seven minutes from time. Posh had long abandoned ship. It was a performance legend Chris Turner - who was honoured by the club’s fans today - would never have allowed to happen. Posh: Luke McGee, Michael Smith, Jerome Binnom-Williams (sub Junior Morias, 74 mins), Ryan Tafazolli, Michael Bostwick, Leo Da Silva Lopes, Chris Forrester (sub Gwion Edwards, 66 mins), Marcus Maddison, Martin Samuelsen, Paul Taylor, Lee Angol (sub Tom Nichols 66 mins). Unused substitutes: Mark Tyler, Brad Inman, Callum Chettle, Dominic Ball, Junior Morias. MK Dons: David Martin, George Baldock, Harvey Barnes (sub Robbie Muirhead, 73 mins), Joe Walsh, Paul Downing, George Williams, Ed Upson, Darren Potter, Kieran Agard (sub Daniel Powell, 84 mins), Chucks Aneke (sub Callum Brittain, 88 mins), Nicky Maynard. Unused substitutes: Lee Nichols, Dean Bowditch, Georgio Rasulo, Ben Tilney.